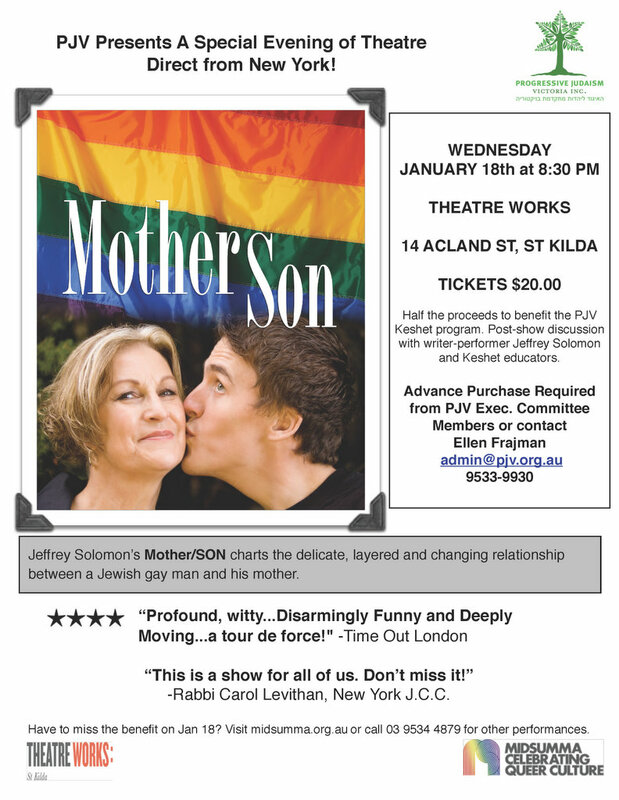 Progressive Judaism Victoria invite you to their Keshet fund-raiser evening on January 18 2012 during the Midsumma festival. Half of the proceeds of this evening go toward the Keshet program, to benefit GLBT people in Victoria. See the flyer below for details or check out the event on Facebook. More details of the event on the Midsumma and Theatre Works sites. Note, you must book directly via PJV if you want to assist the Keshet fund-raiser. This entry was posted in Culture/Tradition, GLBTIQ, Jewish and tagged Gay, GLBTIQ, Keshet, Lesbian, Midsumma, PJV, Progressive Judaism. Bookmark the permalink.